Before the official announcement, the iPhone 7 rumors spread as that it might be a special one with additional ever two new colors. It might be a device with the capability of 32GB, 128GB, and 256GB. And more on it. –The new Apple watch has made with the Ceramic White. It is best than the Stainless steel with special Nike Plus Watch. –The Apple Watch allows the users to play the Pokémon GO as a Pokémon GO Plus. It is a new updated version game from the developer. The watch also designed with the PokeStops time with the calories burn. –Apple Watch series 2 included few more apps as it allows the Gif messages, special stickers, sharing and more. –We can make Fast SOS call with the location in Emergency. –Also had other most popular Apps that we need to the present world from Sports to fitness. –The Second generation SiP had the 2nd generation display with 1000nits, built-in GPS, Dual-core, heart rate sensor, comprehensive workout app. The Apple Watch series 2 will available from September 16, 2016. Nike Plus Watch: Needed one for every athlete. Best Running Experience,Motivate Running Notifications with a Running Club. The Nike+ will available after the October of this year. iPhone 7 Plus camera can do bokeh with new Portrait mode. Dual cameras work together to create the depth map, blurs background. Read the complete iPhone 7 and iPhone 7 Plus Specifications here. The New dual camera and camera app had a new button to instantly zoom to 2x, which switches to the telephoto. And up to 10x digital zoom for photos. Further zoom is digital. One for normal and another one for telephoto. Though both of the cameras has designed with 12MP and it is 60 percent faster than previous. The iPhone 7 Plus Camera is different from the iPhone 7 camera. 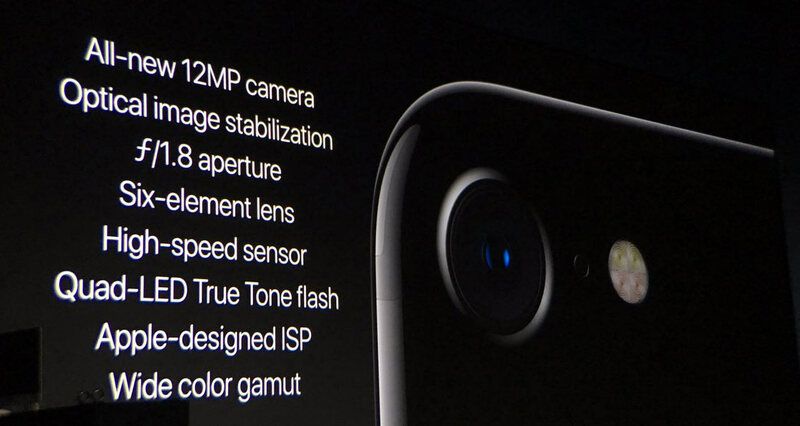 It will avail with the 7MP Facetime HD Camera with wide color capture, and image stabilization. Schiller says, “Thanks to wider color gamut means richer colors in pics.” The new Apple iPhone camera packed of the larger f/1.8 aperture, six-element lens. New ISP does 100 billion operations in every photo. New Home button is introduced for these two phones. 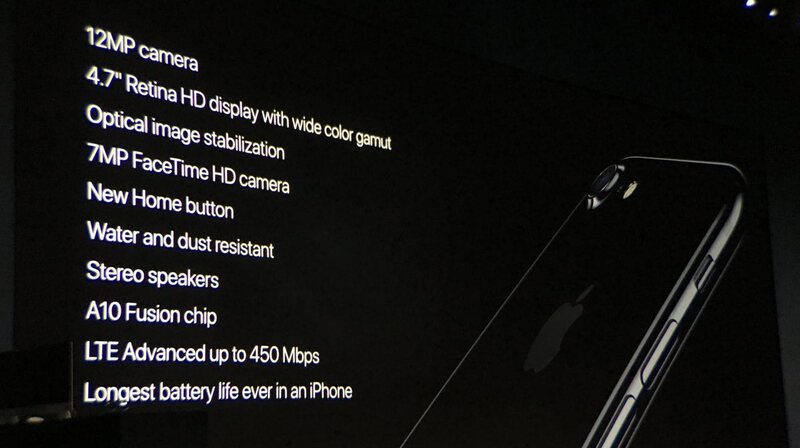 The Home button has the following features. It is along with Multi-Tasking, Siri, Apple Pay, Re-Engineered with Force Sensitive Taptic Engine API, Quick Actions, and Notifications. It is under the iPhone 7 and iPhone 7 Plus Specifications. About Available Colors: Jet Black, Black, Silver, Gold and Rose Gold. Yes.! there is two black design for this two new Apples. Tim Cook says, “all the things you do every day so much better.” And the 3.5 headphone jack adapter is stayed back and also introducing new EarPods. Also, it is called as AirPods. People can hear the music wirelessly. Also, consist of Stereo Speakers and the improved Dynamic Range. The new single processor can do 100 Billion Operations in 25milli Seconds. The New models of Apple iPhone in 2016 will release along with 32GB, 128GB and 256GB memory storage. The Following countries will get this new phones from September 16. The Preorder sale will begin from September 9, 2016. Australia, Austria, Belgium, Canada, China, Denmark, Finland, France, Germany, Hong Kong, Ireland, Italy, Japan, Luxembourg, Mexico, Netherlands, New Zealand, Norway, Portugal, Puerto Rico, Singapore, Spain, Sweden, Switzerland, Taiwan, UAE, the UK, US Virgin Islands and the US. 23th September 2016 is the another date which is for the people those who all living in the following countries. Andorra, Bahrain, Bosnia and Herzegovina, Bulgaria, Croatia, Cyprus, Czech Republic, Estonia, Greece, Greenland, Guernsey, Hungary, Iceland, Isle of Man, Jersey, Kosovo, Kuwait, Latvia, Liechtenstein, Lithuania, Maldives, Malta, Monaco, Poland, Qatar, Romania, Russia, Saudi Arabia, Slovakia and Slovenia. For the Indian People, You all will take this newly released phone from October 7. From the Pre-Order date to release dates of countries meets the date as Friday. The Latest Apple iPhone 7 and iPhone 7 Plus will available at the official online website as apple.com, Apple Stores, Apple Authorized Resellers and select carriers. The Price range begins from $649 (US) for 32GB, 128GB, and 256GB. According to the Indian Price, the 32GB variant of the iPhone 7 is said to be priced at Approx. Rs. 52,900, the 64GB variant at Approx. Rs. 60,900, and the 256GB at Approx. Rs. 70,900. The iPhone 7 Plus is expected to be priced at Approx. Rs. 60,900 ($769) for the 32GB variant, Approx. Rs. 68,900 for the 128GB variant, and Approx. Rs. 78,900 for the 256GB variant. The separate AirPods also available in Official stores under the price of $159 (US). The AirPods include with charging case. The 3.5 mm Headphone Jack Adapter also available in store at $29 (US) and $9 (US), respectively. The Official Apple iPhone 7 leather and silicone cases also in the Apple Store at $35 (US). And the black and white iPhone 7 Smart Battery Case at $99 (US).